The filter cannot be adequately cleaned because of very poor design. The metal is *very* thin, and the top rim was folded over, then folded inside, whereby a gap of more than 1mm all around is created. Loose tea will collect, and cannot be rinsed out without a waterpic device or something similar. Yeck. The product was a good idea, but the filter is a mold factory. The metal top does indeed become blazing hot. 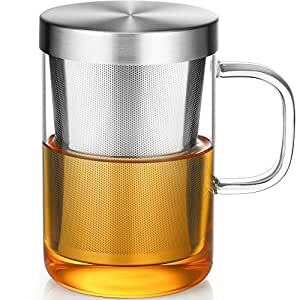 The boro glass mug will accept the Finum mesh brewing basket, large size (awesome in regular and large sizes), but the mug itself is not really an ideal receptacle for brewing tea or coffee, although one can measure 12-13 oz. by the placement of the handle. Filter; top; mug: Fail; Fail; meh. I absolutely love using this tea mug in the office. I like it so much that I've purchased another one for home use. It cleans-up well and the little particles of tea debris doesn't get stuck in between the metal filter.